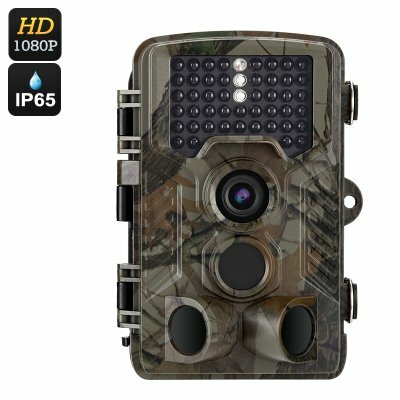 Successfully Added FHD Digital Trail Camera - 1080P, 12 Months Stand-By, 0.6 Seconds Fast Shooting, 2.4 Inch Display, IR Cut, 20M Night Vision to your Shopping Cart. Quietly capture footage of animals and all the other beauty that Mother Nature has to offer in stunning 1080p FHD resolution with this digital trail camera. Tracking animals and shooting images or video of wildlife without disturbing them has never been easier. With this HD wildlife trail camera you will be offered all means necessary to scout out a given area before hunting season kicks off – allowing you to find the best hunting locations without being noticed. So no matter if you’re scouting the area for future game, looking for superior hunting locations, or simply want to capture stunning footage of nature in all its glory, this digital HD trail camera offers the answer to all your demands. Recording footage in stunning 1080p resolution this outdoor camera will provide you with beautiful images and footage, allowing you to built up a detailed understanding of the wildlife presence in a particular area. Powered by 8 replicable AA batteries this trail cam offers a stunning 12 months of standby time, allowing you to capture and analyze animal movement in an area throughout the seasons without the need of worrying about battery life. Additionally, this camera also supports external batteries and even solar energy when attached to an external solar panel. With a trigger time of nearly 0.6 seconds this trail camera can quickly snap a shot once the target has entered its detection zone. Featuring 46 LEDS it additionally offers 20 meters of night vision, bringing along great results and high detail images even during the darkest of winter nights. With a programmable time lapse feature, the camera can be set up to snap photos at intervals of 5 seconds, allowing you to capture all the animals as they pass by no matter how big or small. With this IP56 rated water resistant outdoor camera you can be assured to get ahead of the game, guaranteeing that you won’t return home empty handed this hunting season. This digital trail camera comes with a 12 months warranty, brought to you by the leader in electronic devices as well as wholesale electronic gadgets..